Former Street Names: Cave Street and Hurdman Street (between Wellington and Scott) and Second Street (north of Scott). First established: 1872 (Mechanicsville portion) and 1878 (Hintonburg portion). 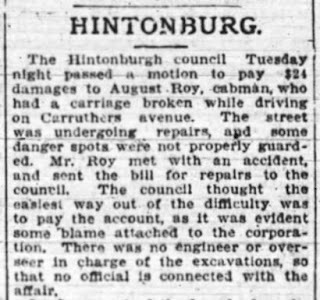 Name meaning: The street is named for Aaron Carruthers (1842-1927), who was briefly a resident of Hintonburg and served on its first village council. 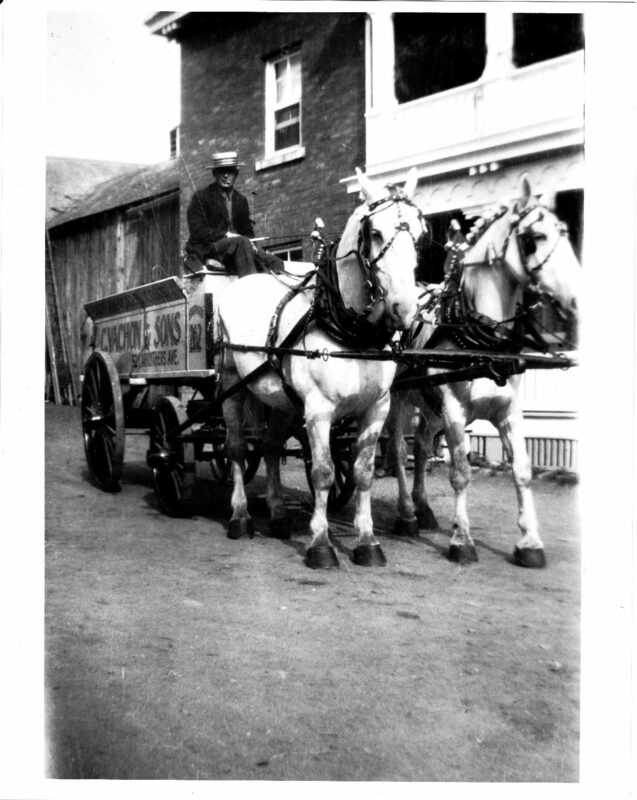 Carruthers was the son of one of the founders of Bytown, John Carruthers, who came to Bytown with Colonel By. Aaron worked for the lumber firm Perley and Pattee for 30 years, working his way up to the position of yard superintendent, and also later worked with the Bronson Company, Ottawa Electric Railway and the Ottawa Car Company, always in the lumber divisions. 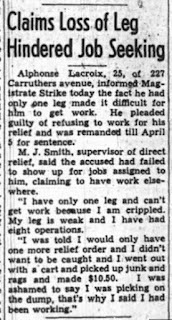 The Citizen referred to him as the "Dean of Lumber Employees" in 1924. 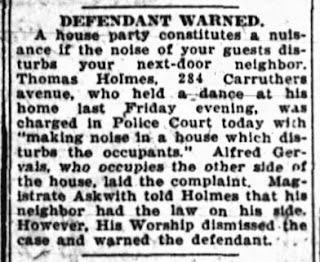 He and his family resided in the stone house at 1119 Wellington Street (the Magee House, which still exists today) from 1891 until about 1897. How named: Cave Street was a name used only on paper, no one ever lived on it while it had that name. It was named Cave Street due to Cave Creek which ran through the street, and also because there were caves that opened up along this street. 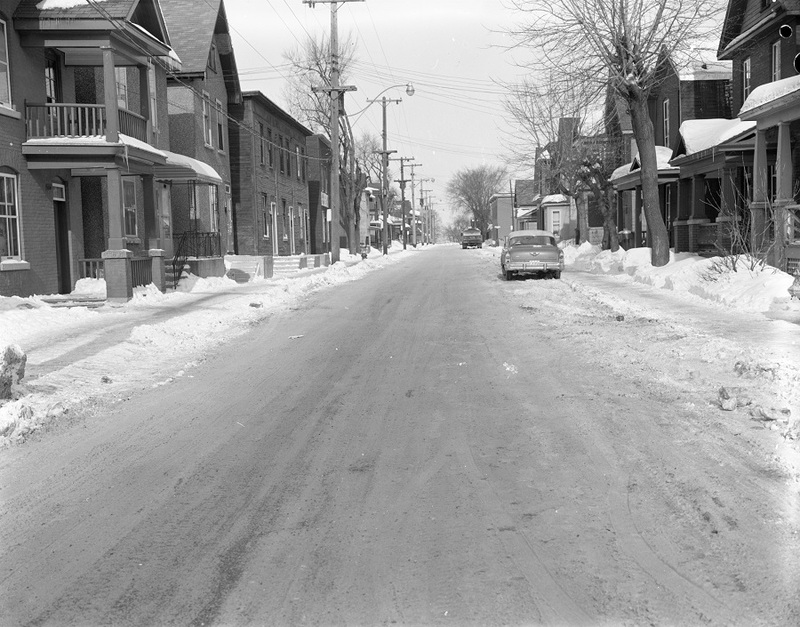 In the late 1880s, the name Hurdman Street was used briefly, as a large portion of the street had been purchased by the well-known lumberers, brothers William and Robert Hurdman. However, in 1893 Hintonburg separated from Nepean Township, and became an independent village. 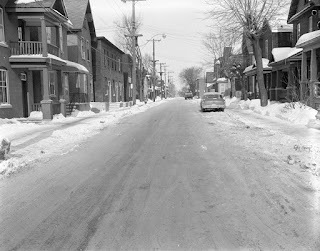 In 1894, several of the streets in the village were renamed to honor members of the first village council that had been stood up in 1893, thus Hurdman Street was renamed "Carruthers Avenue" (other renamed streets in Hintonburg for members of that council include Ladouceur, Gilchrist, O'Meara and Young). Carruthers Avenue at this time ran only from Wellington north to Scott. 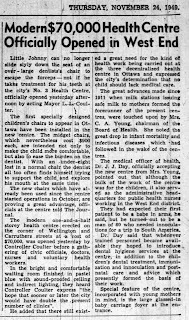 The Mechanicsville portion was renamed from "Second Street" to Carruthers Avenue in 1912 after Mechanicsville was annexed to the City of Ottawa, and of course Second Street was already a well-used street name in Ottawa. The decision was made to simply use the Carruthers name and create one single-named street from Wellington to the River. The first part of Carruthers that was laid out was on the Mechanicsville side of Scott Street. The plan was filed in 1872 by Blasdell and Baldwin, who operated lumber mills near the Chaudiere, and who looked to establish a residential area for their workers. In 1872 there were only a few farming homesteads west of Bayswater, and it was just the thin, rocky Richmond Road that ran to the west. The Canada Central Railway had just opened their line from Lebreton to Carleton Place in 1870, and so this small area between the rail line and the river was chosen by Blasdell and Baldwin as an ideal spot for their small subdivision. It also helped that the land was available cheap from the Nicholas Sparks estate. Lot sales in the new "Mechanicsville" section began in that summer of 1872. The original Mechanicsville Plan (Carleton County Plan 35). Records from this era are extremely scarce, and it requires some deep digging to come up with information on the residents of the area. The city directories of these years did not include Mechanicsville. The first Census to include Mechanicsville would not be until 1881. 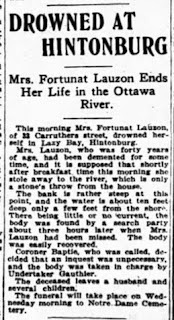 And even land registry records at this time are incomplete; this is not uncommon from this period that land-owners would sell a lot, even assist the owner in building a home, but nothing would be officially registered with Carleton County (Mechanicsville would not become part of the City of Ottawa until 1911). In many cases, the land-owners reneged on their purchase, or abandoned ownership, and thus their names never appeared in any official documents. The best source of data for the 1870s is the old Nepean Township assessment rolls, and even these are iffy at best. In this era, the roll-takers often wrote names phonetically, thus with a large French population, names were often badly misspelled; "Guilbault" became "Gibo", "Boudreault" became "Budrow", and so on. Also the rolls, believe it or not, were inconsistent in their completion. Many lots would be missed or skipped, and the roll was taken over a three month time frame, therefore ownership may have changed in the meantime, resulting in some lots being listed twice with two different owners, etc. 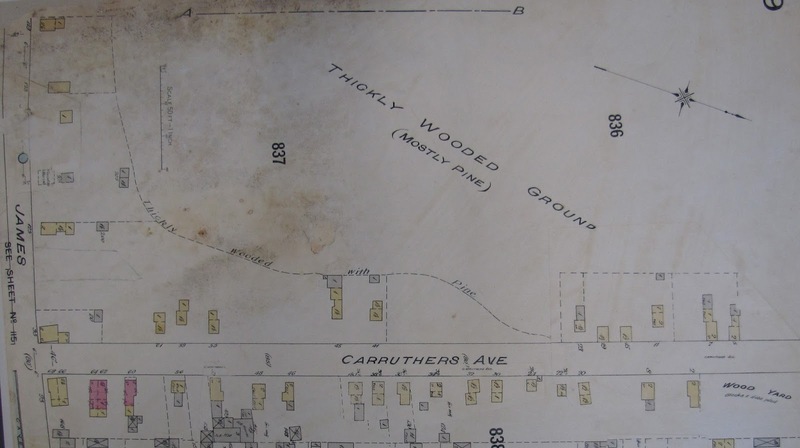 Based on available sources, it can be determined that the first 6 houses built on what is now Carruthers Avenue were built between late 1872 and early 1873. They were mostly constructed at the north end of Carruthers, which is the opposite of what you might have expected. However keep in mind at the time, that Scott Street did not exist, and in fact Hintonburg was still barely a hamlet, with a few houses located mainly just off of Richmond Road. 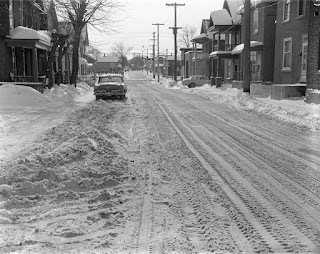 The north location of the new homes was ideal because of the proximity to the River and the original road east to the city ran along the river, following roughly the route of Bayview Road (formerly called Little Chaudiere Road). The first houses were built near Burnside, arguably due to their water view. 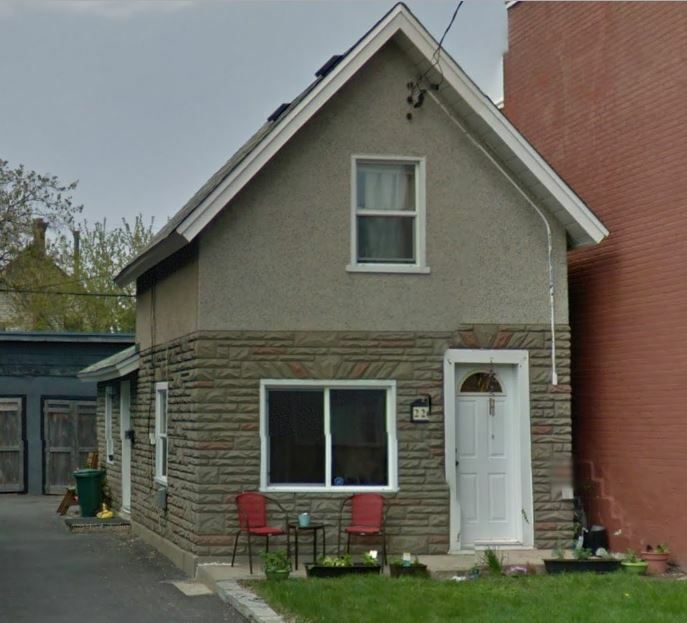 These first houses built on Carruthers in late 1872/early 1873 were: on the west side of the street, on lot 1 (fronting onto Burnside, #28 Burnside, torn down in the late 1980s) built by William Guilbault; and on lot 2 (#50 Carruthers) by Charles Jubinville; and on the east side on lot 1 (at the corner, fronting onto Burnside, #20 Burnside, torn down in the 80s, now the site of the large apt complex at 18 Burnside) constructed by contractor by James Marks; lot 2 by J.C. McEwen (#49 Carruthers, also torn down in the 80s to build 18 Burnside); lot 9 (#85 Carruthers) built by F.X. Sauve; and the north half of lot 10 (now the site of #87 Carruthers, the original house burned in 1897) by Stephen Robataille. Thus, 143 years later, there are just two of the original Carruthers Avenue houses remaining. The Jubinville house at #50 (which was not bricked until sometime between 1912-1922. It originally had a simple wood-framed exterior like all of its contemporaries. 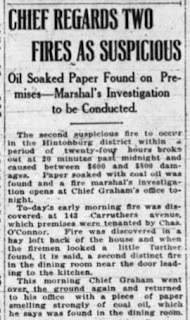 Mechanicsville only had a handful of bricked homes prior to WWI. This house later became the long-time home of Charles Vachon, well-known local ice dealer. Meanwhile, 85 Carruthers became part of a cluster of homes built by stonemason F.X. 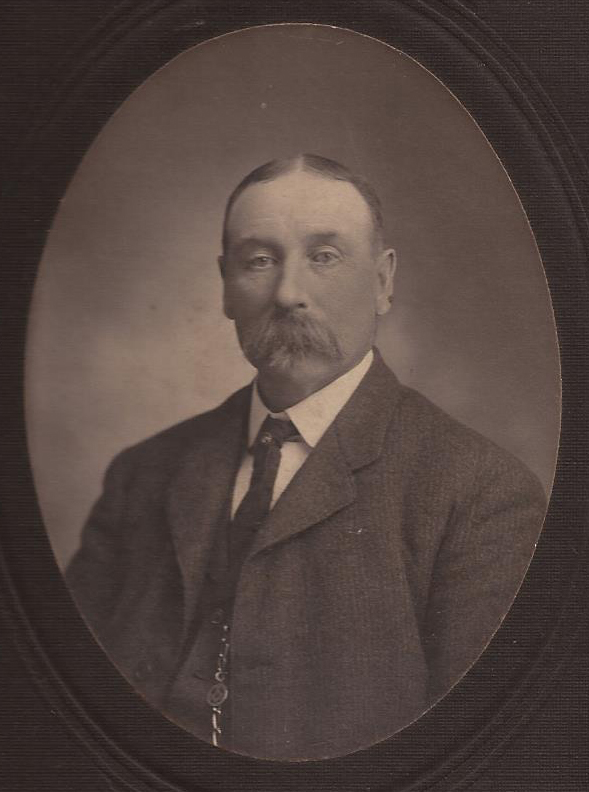 Sauve (my great-great-great-grandfather) on the east side of Carruthers. F.X. was likely one of Mechanicsville's best-known early citizens, as he bought and sold many properties over the years, building houses, and acquiring and renting out others. 81-83 Carruthers next door actually remained in our family until the 1980s. Mechanicsville's growth was quick, with several homes constructed on Second Street (Carruthers) annually throughout the 1870s and 1880s. The second part of Carruthers, which falls between Scott and Wellington, was created as part of Carleton County Plan 83, laid out by land-owner Christina McGaw (1805-1882) on February 22nd, 1878. 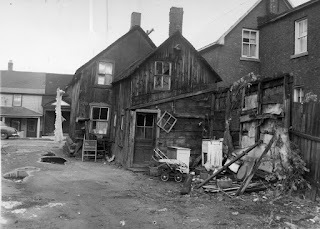 Like several other of the small puzzle-pieces that make up Hintonburg, the McGaw lot was one of the individual blocks split from her mother Janet Anderson's estate in 1861 (just as discussed in the Stirling Avenue history I wrote on this blog in January). Anderson and her family were one of the pioneer families of Hintonburg, first acquiring the property in 1831, and arriving from Paisley, Scotland sometime in the 1850s. In 1861 Janet Anderson split her 80 acres of Hintonburg property into 8 blocks, providing one to each child. Christina McGaw's lot was "Block 7". Christina and John McGaw built a home on the southwest corner of their property soon after acquiring their piece of land in 1861, on where the Ottawa West Community Support building now sits. John McGaw at first made his living as a tailor, but in 1864 (at the age of 64), opened up the area's first tavern in this home. He would continue to operate this tavern until his death in December of 1877. Following his passing, his widow Christina decided to file a subdivision for her property, and thus Carleton County Plan 83 was laid out February 22, 1878. It consisted of just one street, Cave Street, running north from Wellington to the CPR tracks (now Scott Street), split in to 43 small lots. McGaw remained in the house on lot 1, but immediately transferred lots 2-16 to her daughter Christina, lots 17-26 to daughter Elizabeth, and lots 27-43 to son Andrew L. In 1880, she sold the home on lot 1 to her son John and moved back home to Scotland for a short period. Development on Cave Street would be slow. By 1886, there were only 2 houses built on the Plan 83 property. Alexander Wilson, a bailiff, had purchased lot 1 from John McGaw and resided in the old house on the west half of the lot, and built a second structure on the east half of lot 1, which he rented to grocer William Hogg. In 1882, Thomas Gillespie, a foreman, purchased lots 42 and 43, and built a building on lot 42 which is now the site of 1121 Wellington (now the Oresta Apothecary, formerly Arbuthnot Drugs and Tony's Shoe Repair), but which opened as a toll house by the Bytown Nepean Road Company for travellers moving west on Richmond Road. This original building burned down, but was rebuilt in 1888, which still exists at present. 226 Carruthers in 2015 (at age 127). 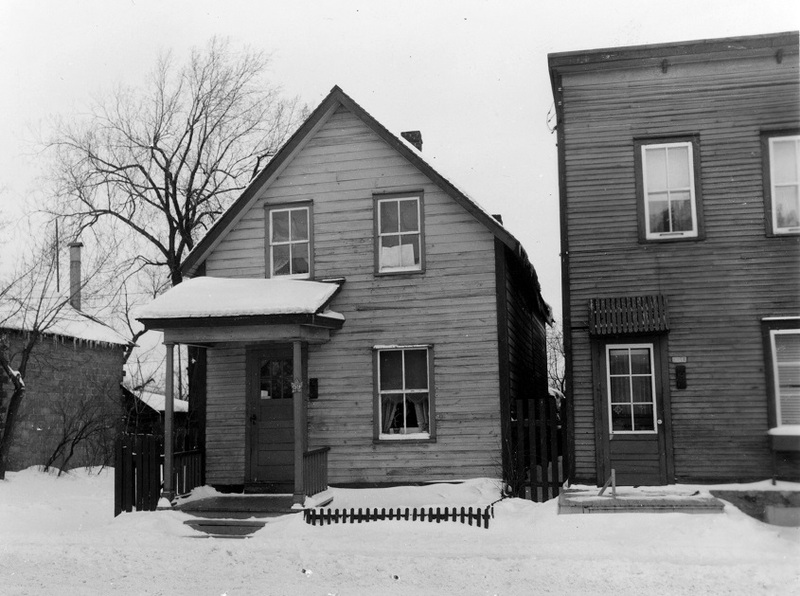 However, these buildings are both Richmond Road buildings; the first two houses to actually be built on what we now know as Carruthers Avenue on Plan 83 were constructed between 1887-1888 by 29-year old machinist Francis John Stubbington Jr. on lot 12 (226 Carruthers, which still stands today) and by 32-year old labourer William McAllister on lot 11 (torn down in the 1990s, now the site of a double that re-uses the civic number 232 Carruthers). During the 1890s, Carruthers Avenue experienced tremendous growth, as evidenced by the fire insurance plan below, which shows the east side of the street nearly full of houses. The forest-like west side of the street would take a bit longer to develop, but by 1910, it too was nearly completely built on. area west behind the property lines is simply called "Thickly Wooded Ground". Avenue was at the time, a dense forest of pine trees. 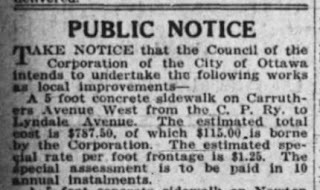 Carruthers Avenue actually grew in 1908 when the Ottawa Land Association filed Plan 258 extending all of the Mechanicsville streets all the way north to the Ottawa River's edge. This meant adding 17 new lots on what was still called Second Street, north of Burnside. Only a few houses were ever built in this area, and in 1949, the Federal District Commission (now the NCC) began expropriating homes as part of the plans to build the Ottawa River Parkway.The Vachons, the community's most famous ice-delivering family were the last to holdout, finally selling a property they owned in 1954.
emptiness of Tunney's Pasture is evident in the background. buildings surrounded a large wood and coal yard. Over the years, a variety of mostly small, out-the-main-floor-of-the-house type businesses have operated on Carruthers, both in the Mechanicsville and Hintonburg segments. 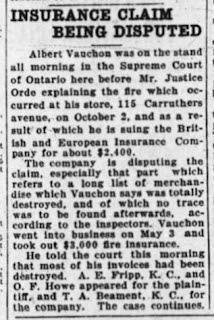 The most well-known of these is the Vachon family business opened by Charles Vachon in 1908-09 on the lots of 50-52 Carruthers Avenue. The Vachons wound remain on this location as ice, coal and wood dealers until the early 1950s; their boarded-up small office somehow still stands at #52 Carruthers, a symbol of a way of life in Mechanicsville long since lost. 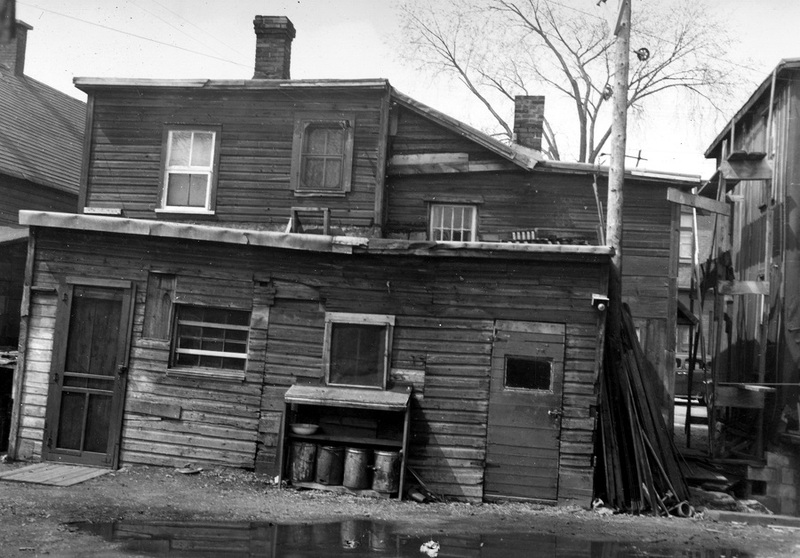 The Vachons also had a huge 50x50 ice house on the opposite side of Burnside (visible in the photo above). Late in its life, the ice house became a storehouse, but the massive wooden structure fell prey to fire in August of 1950. The bay at the end of Stonehurst, officially known as "Lazy Bay" was informally known by Mechanicsville residents for years as "Vachon's Bay" because the Vachons acquired their ice from this spot. 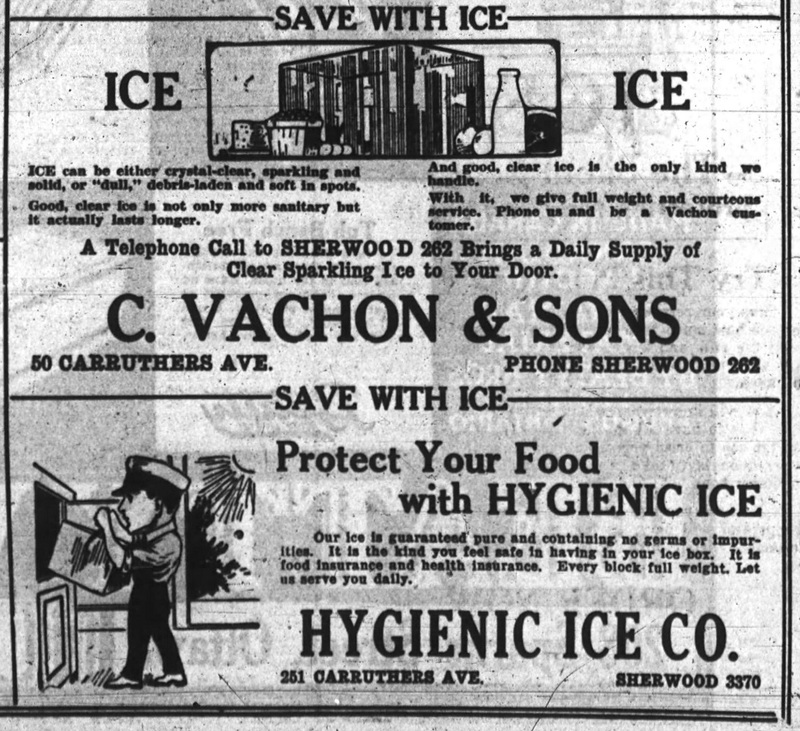 The Vachons also had a second ice company on the Hintonburg portion of Carruthers, operating out of the lot where a multi-unit building now exists at 251 Carruthers. 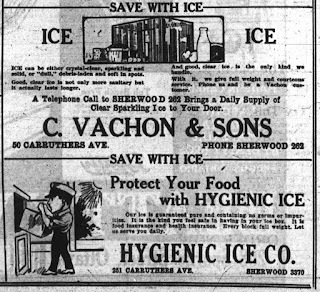 This business operated under the franchise name the "Hygienic Ice Company". It had originally been opened by an ice selling competitor, Louis Croteau, in 1907. 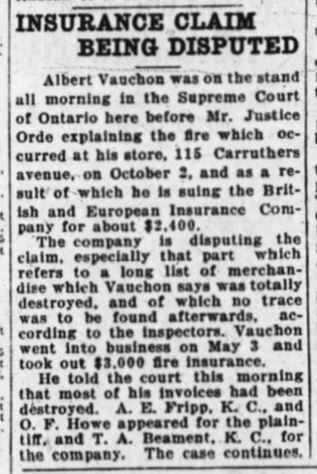 But by 1920, the Vachons had taken over, and remained in business here until the early 50s. 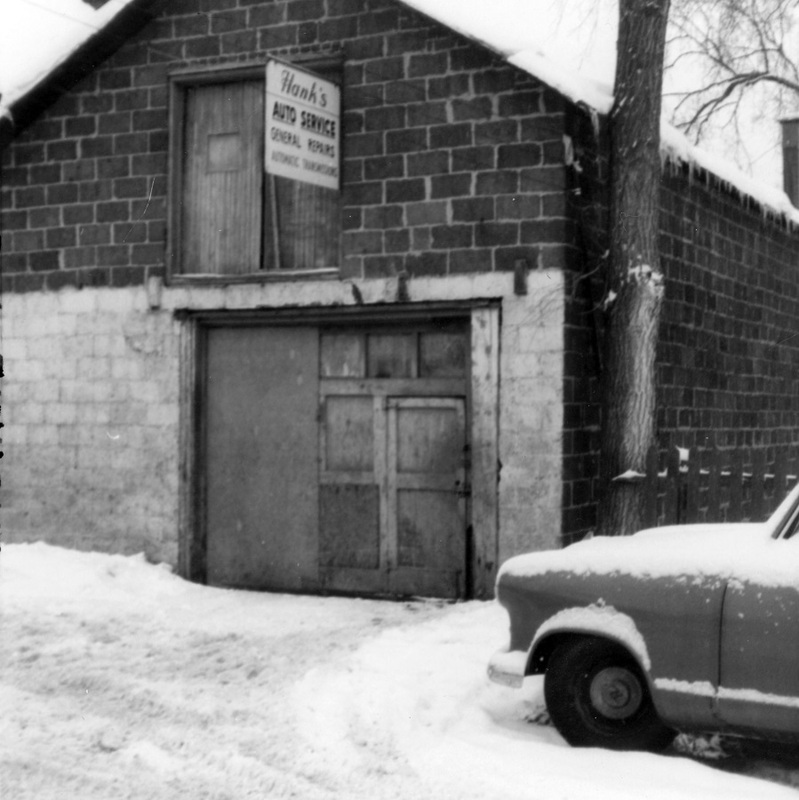 The brick house at #255 was where Desire Vachon resided while operating the ice business next door. Neighbourhood grocery stores were very common in the pre-automobile era, and were often opened on the main floor of houses and operated by housewives looking to supplement the household income. At most any given time from the 1870s up until the 1940s, you would find one of these small grocery stores on almost every block. The first on Carruthers opened all the way back in 1874, when Stephen Robataille opened a grocery store in his house on Mechanicsville lot 10 (now the site of 87 Carruthers), just north of Lyndale. The house at 116-118 by Michel Bourguignon was converted to a grocery store after Bourguignon in his late 50s retired from manual labor. He sold in 1921 to John Robillard, and in May of 1937 it was purchased by Isabelle and Isidore Renaud, who ran a restaurant/store from this location for many years. Across the street at 115 Carruthers was a grocery store operated by John Sugrue in the 1910s and 20s. What many readers will most recognize and remember are the shops at the intersection of Ladouceur. This has been the site of small grocery-convenience stores dating back to 1912, when Louis Lavergne opened what is now Charlie's Confectionery at #220. A photo at left shows it in January of 1967 when it was operated by Mozart Guerin. Kitty-corner to this building at the corner of Ladouceur is #221 Carruthers. It was built in 1922 initially as a residence, but in 1932 was renovated into a grocery store and restaurant by Rachel Kenville. Mozart Guerin took over operations in 1937, before moving across the street around 1950. 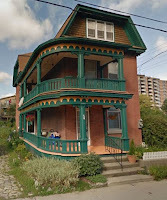 #221 remained in various forms as a restaurant (Donat Lavoie in the 1950s) or confectionery (Papineau Confectionary in the 1970s) into the 1980s, before shifting back to a residence. 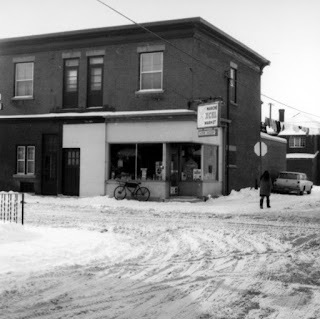 I wrote an article for the Kitchissippi Times discussing Charlie's and the importance of the local convenience stores back in the winter, which you can check out at https://kitchissippitimes.wordpress.com/2015/04/02/what-does-the-future-hold-for-kitchissippi-corner-stores/. Of course there has always been commerce at the corner of Carruthers and Wellington. 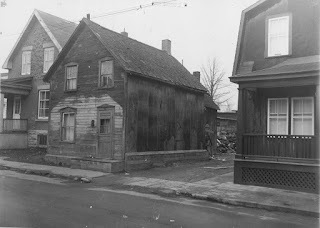 The McGaw tavern existed on the north-west corner from 1864 to 1877, but this was prior to Carruthers Avenue actually being opened up. 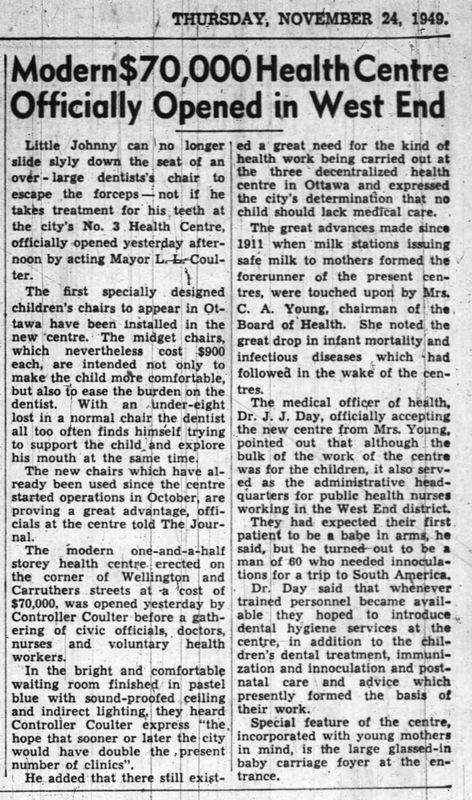 A block of five houses sat here until demolition in 1912, when an investor had purchased the block for development, but it sat empty for nearly 40 years until the City of Ottawa opened a Baby Health Centre here in 1949. 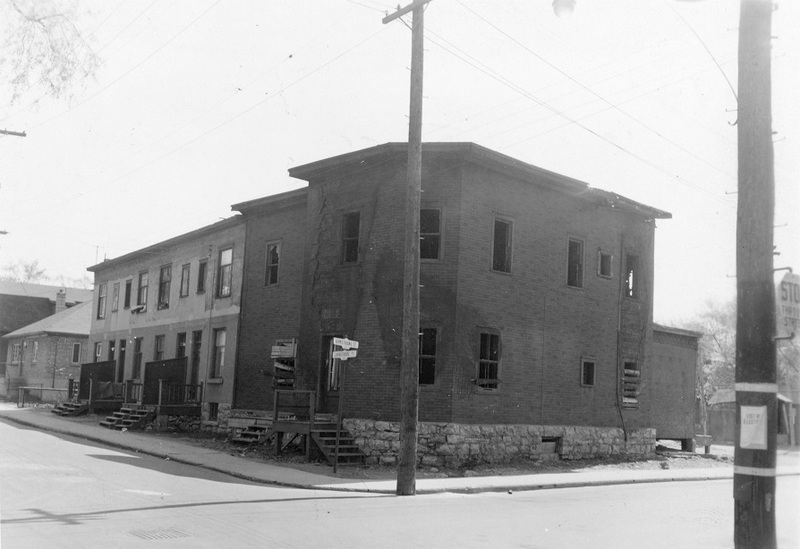 This same building now remains as the Ottawa West Support Centre. The north-east corner featured a small house fronting on Wellington until it too was demolished in 1912, and the three-storey apartment building Iona Mansions were built in it's place. The main floor of the building featured retail in four individual spaces, which at the outset included Victor Aubin's printer shop at 1123 Wellington (now Wellington Sandwiches), the first west-end branch of the Ottawa Public Library at 1125 Wellington (now Collection Y.B. ), Thomas McComb's photography studio at 1129 Wellington (now ABC Driver's Training) and John Clademenos's fruit store at 1131 at the corner (now the Extraordinary Baby Shoppe). The store at the corner may be best remembered by long-time residents as the side of West End Sweets, which took over Clademonos's shop in 1934 and remained until the 1970s. Paul Johanis on his always-interesting blog describes it wonderfully first-hand: "This was on old soda shop, already past its prime in the mid-sixties,..Dark wood panelling, wooden benches and booths, with 3 for a quarter juke boxes in each, it was the perfect hangout for having a Coke and order of french fries with your buddies." 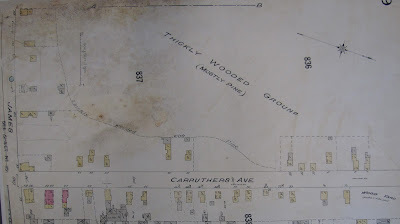 The early days of Carruthers also featured a lot of wood yards, and wood piles for storage. The old St. Francois D'Assise School (which faces onto Stirling) opened in 1933, with its play yard fronting Carruthers at the corner of Scott. 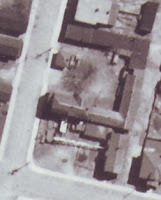 However, on this location (the yard only) was an industrial storage site for at least 10 years (I can find evidence of existing from about 1902 until at least 1912). It was described as a "Wood yard" with slabs and piles of wood, and by 1909, a 2-storey motorized stone crusher with a large platform was installed, accessed off of Scott Street. 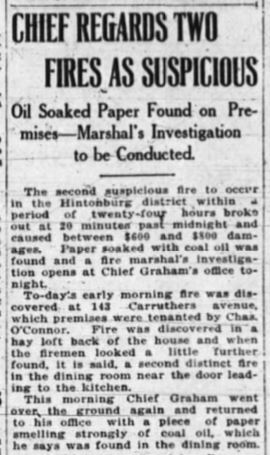 The property at the time was owned by David Manchester, a well-known Ottawa businessman who had taken a great interest in investing in Hintonburg real estate in the 1890s, and had purchased almost the entirety of Carruthers Avenue on both sides from Scott to almost Ladouceur for $1,000 in 1901 (this section was not yet built on at the time). 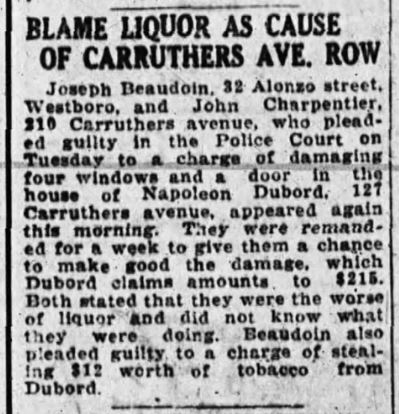 He had also purchased a dozen lots on the east side of Carruthers running almost to Wellington from Ladouceur in 1899. So by 1901, Manchester owned about half of the Hintonburg Carruthers section. He would gradually sell the lots one by one, and helped lot-buyers build their homes by providing extensive credit with easy terms. Lastly, 55 Carruthers, photo at left, was for years known as Hank's Auto Service. It was built around 1946 by the Vachons, who also owned this property across from their main home and business. By the mid-50s, the Vachons began renting it out, and it became Ouimet's Garage, but was chiefly operated by Henrick "Hank" Van't Slot, from the early 60s until just recently. Incidentally I noticed by googling the address that the property is presently for sale, for the whopping price of $750,000! A pretty snazzy jump from the $20,000 the Vachons sold it to their long-time tenant Van't Slot for in 1980. The south-west block of Carruthers at Armstrong is now the site of a still relatively-new park and community space (McCormick Park), which opened around 2000. However, for many years, it was home to a block of five different housing structures: a two-storey wood-frame home on the corner (#278/280 Carruthers), a four-unit rowhouse attached to it's south (#282-288), a bungalow with a garage in the backyard (#294), a brick duplex (#296/298), and a small wood-frame duplex which fronted McCormick Street (#7-9 McCormick, and whose rear wall nearly touched the rear walls of both 296-298 Carruthers, and also the back wall of the Ottawa West Support building). Most of this block can be seen in the photo at right from May of 1957. The photo was actually taken after a fire decimated the building on the corner. I was surprised to find while researching that it was actually rebuilt somewhat and continued to be used for housing for another 10 years or so. It started life as a grocery store pre-WWI operated by Henry Heney. All but the bungalow were removed as part of the Urban Renewal Project of the mid-1960s, with the bungalow surviving until the 1980s. The space sat vacant for several years, was then improved with trees and benches, before the playground arrived around 2000. F.X. Sauve built several houses in the area, including the double at 81-83 Carruthers. 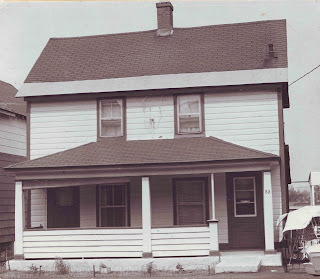 It was converted into a single-family home in 1945, and was where my great-grandparents resided until 1981.
around the turn of the century, in my family until 1981. My grandfather Ted Sauve loved this house. 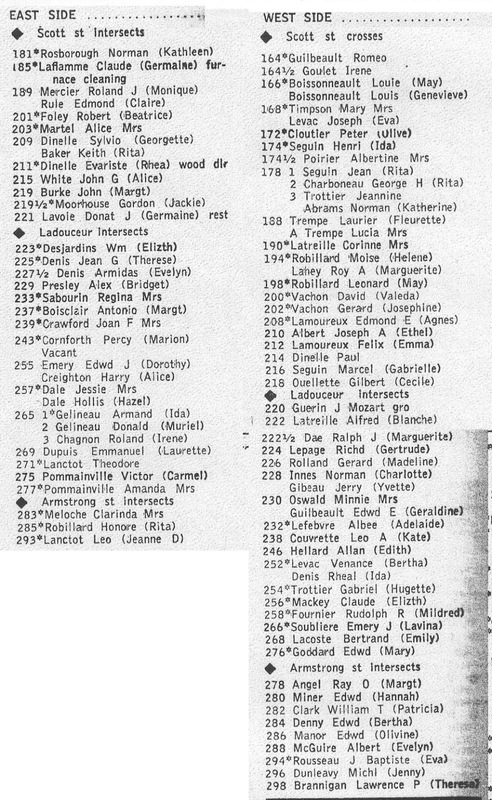 The old Ottawa City Directories are one of my main sources of historical real estate information. 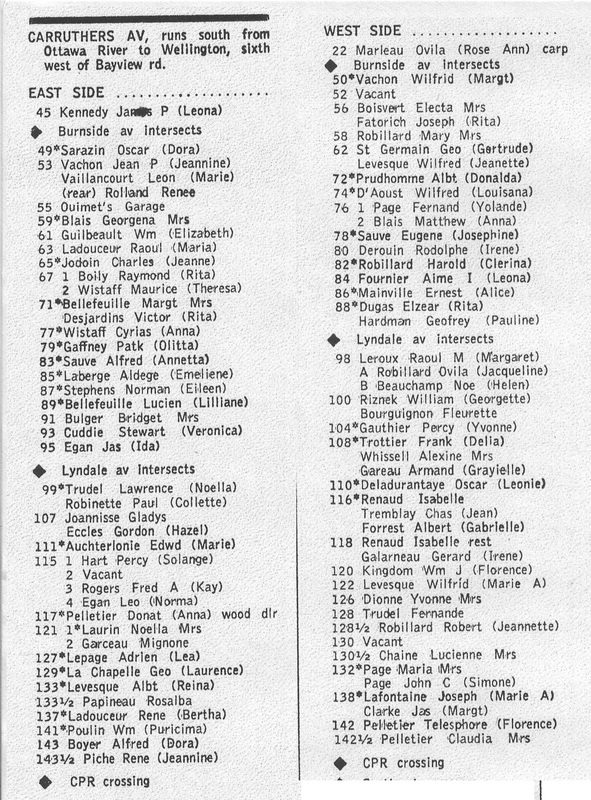 For each year it would list all the residents of every street in Ottawa. 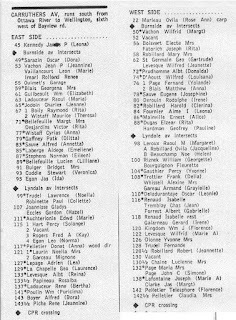 I've included the list from 1956 below. The rear view of 227 & 227 1/2 Carruthers Avenue, circa 1960. 59 Carruthers and the 61 half of the 61-63 Carruthers duplex. These photos I found particularly neat at the archives. 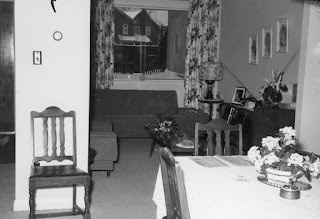 They are from a set of photos taken of the interior of the duplex at 61-63 Carruthers in 1956. 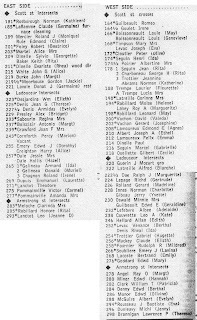 #61 Carruthers was occupied by William and Elizabeth Guilbeault at the time (thanks to the 1956 directory which confirms that). 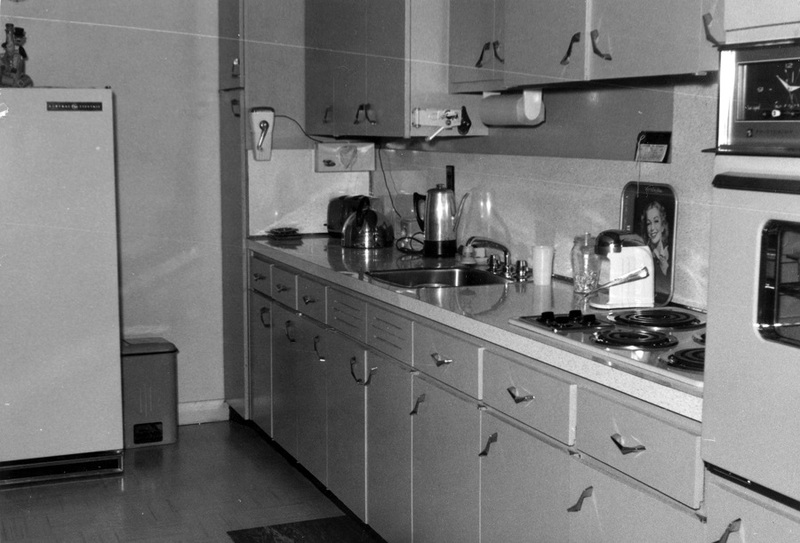 What a great couple of shots showing the interior of a Mechanicsville residence back in the mid-1950s. The dining room and living room of 61 Carruthers. The kitchen of 61 Carruthers. A very cool view looking south down Carruthers. 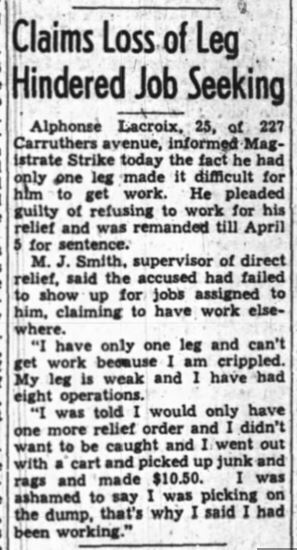 Feb 15/63. Same day, same location, but looking north towards the river. lot 39 at the southeast corner of Armstrong. Now the site of 172 Armstrong Street. 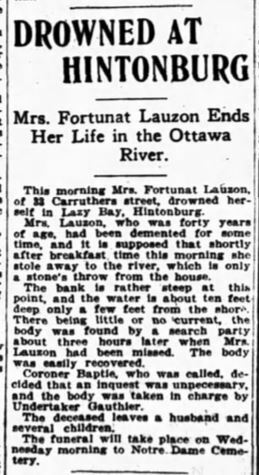 Ottawa Journal, July 30, 1903. 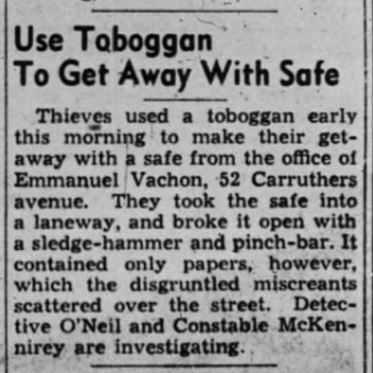 Ottawa Journal, December 1, 1913. The first appearance of sidewalks for Carruthers Avenue. This by no means covers the complete history of Carruthers Avenue, but at least provides a sampling of some of the names and places associated to this unique street over the last 140 years. A street that has been so important to my family for so many years (my grandfather, even though he moved off of Carruthers at a young age, always considered himself a Carruthers Avenue man), and likewise, the home and heart of so many other west-enders for the last 143 years. I invite readers with particular memories (or photos!) of Carruthers Avenue to share them in the comment section below! Thanks very much! This is great. 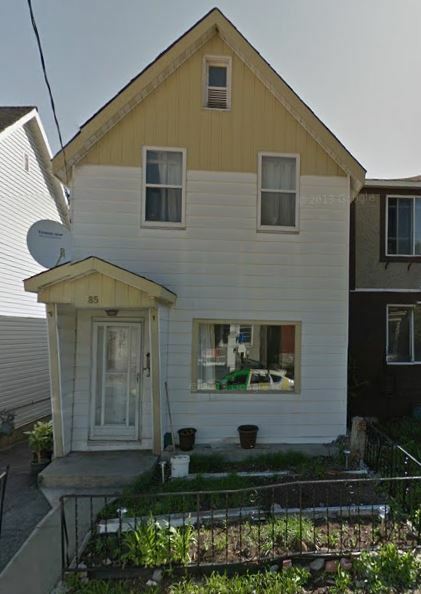 For the picture of 84 Carruthers, The house did burnt down, put not all as you can see in the picture. For what I can remember from my parents telling me, my grand father (Fournier) rebuild it. I use to live there until 1983. I still remember seeing some of the burnt wood in the antic from the original house. Just to add, When the transit way was being build, They had to put in a large sewer and it goes through Laroche Park. When they were digging, I found out that the south end of the park was use for land fill (dump). I remember finding all kinds of stuff (bottles, cans, a lot of glass of all types). If I knew then to keep what I found, it would of been a great collection.